Patras passenger and car ferry ticket prices, timetables, ticket reservations and information for ferries sailing from Patras to Ancona, Bari, Brindisi, Corfu, Igoumenitsa and Venice. Compare all available Patras ferry ticket prices in real time and book the cheapest available Patras car and passenger ferry tickets sailing to and from Patras, Ancona, Bari, Brindisi, Corfu, Igoumenitsa and Venice with ANEK Superfast, Minoan Lines Ferry, Superfast Ferries, Endeavor Lines or ANEK Lines ferries online with instant confirmation. Book Patras Ferry Tickets with ANEK Superfast, Minoan Lines Ferry, Superfast Ferries, Endeavor Lines or ANEK Lines for ferries sailing from Patras to Ancona, Bari, Brindisi, Corfu, Igoumenitsa and Venice online in advance to enjoy the cheapest available ferry ticket price. The price you see is the price you pay. There are no hidden extras or surprises such as added fuel surcharges or booking fees and we do not charge you anything extra for paying with a Visa Electron card. The price we quote you for your selected Patras passenger or car ferry ticket, onboard accommodation and vehicle type is all you will pay, and that's a promise. To obtain a Patras ferry ticket price and book your ferry ticket securely online please use the real time ferry booking form on the left. You are also able to add a hotel at your destination, or anywhere else, to your ferry ticket when completing your ferry ticket reservation. Patras, once known as Patra, this “real” Greek city is still concerned with its wine industry, agriculture and catering for tourists. The third largest city in the country, Patras is best known for its Carnival. Primarily known for its busy port and ferry departures to Italy, not to mention the fantastic carnival held annually to kick off the Lenten season, Patras and the surrounding area offer a wealth of things to do and see. There is a sprawling metropolis by the sea with a wonderful old section. Neoclassical buildings, cathedrals, museums, shops, bars, cafes and vibrant nightlife make this area a treasure waiting to be found. Within easy reach are mountains, lakes, caves, and villages, all with magnificent natural scenery. Patras is very well linked by ferry with Italy (Ancona, Brindisi, Bari and Venice). Local ferries also link Patras to the Ionian Islands. The modern city of Patras was built right on his ancient remains. The city is located at the foothills of Mount Panachaikon, offering a great view of the Gulf of Patras. On the mountain side stands the Castle. It was built on the ruins on the ancient Acropolis, in the second half of the 6th century A.D. The castle comprises a out triangular enclosure, enforced with bastions and towers. Once, the castle was protected by a moat. The inner enclosure was also protected by a moat. Take the famous 193 stairs which start at the top of Saint Nicolas square to get to the Castle. The Ancient Theatre is located right near the Saint George’s square. It’s one of the most beautiful in Greece and was built right after the “Herodeion”, in Athens. The site has been uncovered in 1889 and was rebuilt after the Second World War. During summer, it’s used for concerts and theatrical performances. Saint Andreas Cathedral (Aghios Andreas) is the most important church in the town. It’s dedicated to the patron Saint of the City, Saint Andrew. Near the new church, there still stands the old church which was built on the exact spot where Apostle Andrew was crucified. If you want to taste some of the famous Greek wines, take a journey outside the city to visit the Achaia Clauss cellar. The most well known wine produced here is Mavrodafne. The cellar can be visited from 9 AM to 7 PM and guided tours are offered in English. The Rio-Antirio Bridge connects the Peloponnese peninsula to the main land. Before the bridge was built, tourists were face to take either very long drives or the tedious ferry to get from Athens to the peninsula. Now it’s possible to drive from Athens to Delphi and then over the new bridge to the northern tip of the peninsula. Corinth, Mycenae, Epidaurus and Tiryns are at close reach as well due to the new bridge. Although it’s situated in an area of high seismic risk, the bridge is the perfect safest place to be in a major earthquake. Every year in spring, Patras is home to The Patras Carnival, unique in Greece and the biggest in Europe. The events start on January 17 and last until Clean Monday (the first day of the Eastern Orthodox Christian Great Lent) and include a variety of fun things to do, such as balls, parades and even a children’s carnival. Best Price Guarantee - We always offer you our lowest available ANEK Superfast, Minoan Lines Ferry, Superfast Ferries, Endeavor Lines or ANEK Lines passenger and car ferries ticket price to and from Patras. There are no hidden extras or surprises such as added fuel surcharges or booking fees and we also we do not charge you anything extra for paying with a Visa Electron card. The price we quote for your selected Patras ferry ticket, onboard accommodation and vehicle type is all you will pay, and that's a promise! In the unlikely event you find the same all inclusive Patras ferry ticket cheaper in the brochure of any other tour operator we promise that we will do our best to beat that price or offer you the choice of requesting a refund. 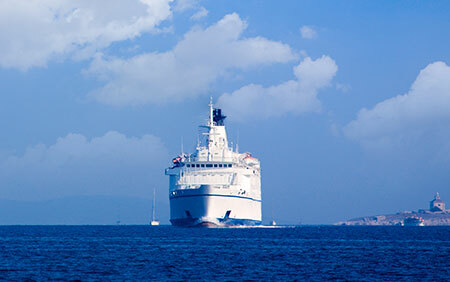 To book Patras car and passenger ferry tickets please click here. At ferryto.co.uk you are able to obtain live Patras ferry ticket prices, check availability and book car and passenger ferry tickets to and from Patras at our lowest available ticket price. Ferryto.co.uk is part of the world's largest online ferry ticket distribution network providing the ability to book over 80 major European ferry operators including to Patras and to over 1,200 other ferry routes throughout the UK, France, Spain, Ireland, Holland, Eastern Europe, the Mediterranean, the Baltic and North Africa.